A proper pub in the center of the city! What is nicer after a long day at work than to chill out with my girlfriend, enjoy a drink and have some proper pub grub? Tonight, Lucy and I are excited to be going to The Black Lion right in the heart of The Lanes and a short walk from the beach. 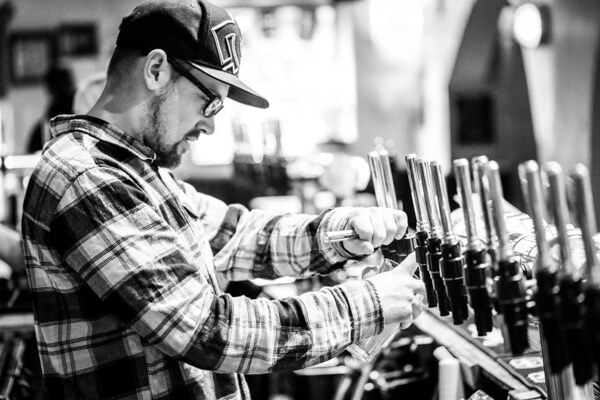 It’s always a great pub to meet friends; the staff and setting are amazing, lively on the weekend with some great DJ’s and perfect for relaxing in day with a tasty beer! We’re excited though as we have heard great things about their kitchen recently and I’ve always enjoyed their roasts, so are ready to tuck straight into the new menu. We walk in and are made very welcome at the bar. I have to say I’m being boring tonight and order a simple lager, but with the great reputation The Black Lion has for cocktails, Lucy ponders the menu and chooses the raspberry daiquiri. Lucy’s eyes light up as she sips her cocktail so I know it must be good. 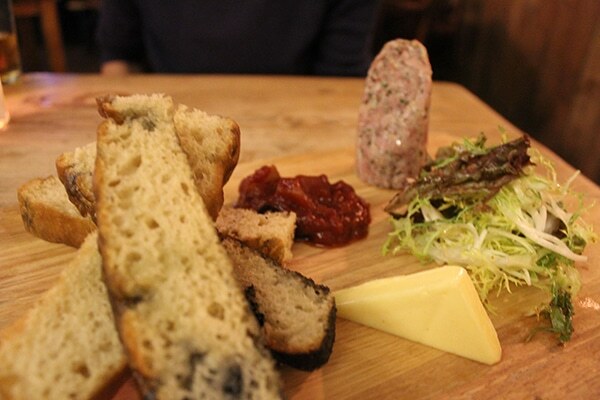 We decide to share starters and order the Spanish black pudding scotch egg, pea puree with bacon salt and the terrine of the week, which is ham hock, served with pear and tomato chutney with toasts. 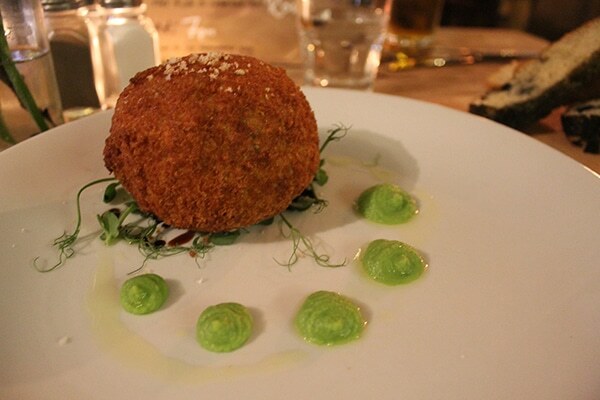 The scotch egg is massive and looks impressive with vibrant green dots of pea puree surrounding the crisp, gold scotch egg. Of course the test is – will the egg be runny? It is, as it oozes on to the plate, you can see the dark meat encasing the egg and I have to dive right in. 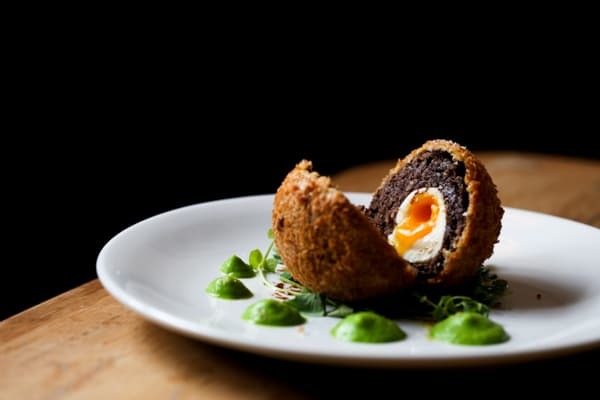 The black pudding filling is full of flavour, rich without being overpowering, the pea puree adds an earthiness that cuts through both the strong flavoured meat and richness of the egg, the bacon salt is a lovely touch for an added subtle flavour. Best scotch egg I’ve had in years! The ham hock terrine is placed as the centerpiece on a wooden board with the pear and tomato chutney and toasts to spread on. It is seasoned wonderfully and the herbs running through it work well with the mustard seeds. Spread thickly on the toast with a dollop of the chutney on top is a taste sensation, the chutney compliments the ham and adds a fruitiness to a very meaty dish. We are given time to relax before the mains are served and order another drink. 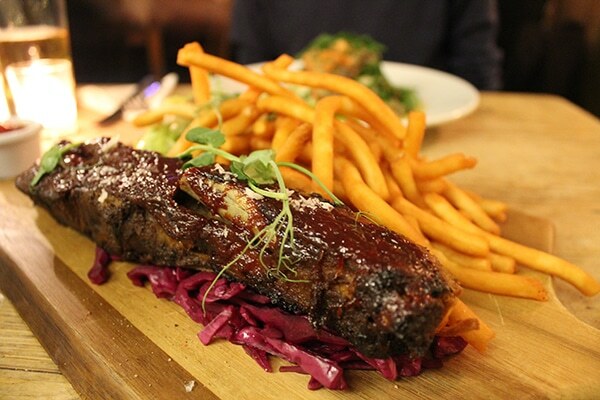 I am very much looking forward to my main of pork belly rib on the bone served with pickled red cabbage, tabbouleh salad and Dutch chips. 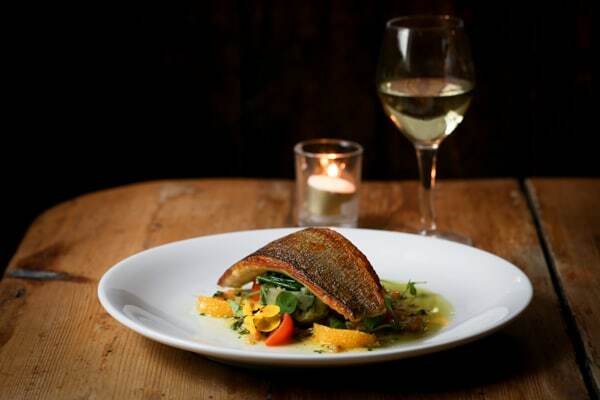 Lucy has gone from the specials board and ordered the sea bass served with mashed potato, samphire and a caper sauce. The pork belly is placed in front of me served on a wooden board, of which the belly covers one whole side. It looks amazing. It has been slow cooked for 12 hours and absolutely glistening with its sweet, sticky glaze, the meat just falls off the bone and is so tender. The sauce is, as advertised, sweet and sticky, just a delight to eat, the kind of sauce you cannot help licking your finger clean with! The Dutch chips are a triumph, really crisp and amazingly fluffy inside, the pickled cabbage adds a great sourness in contrast to the sweet sticky sauce. If you are looking for some real pub grub one evening this is a must for you, well done to The Black Lion, this is amazing. 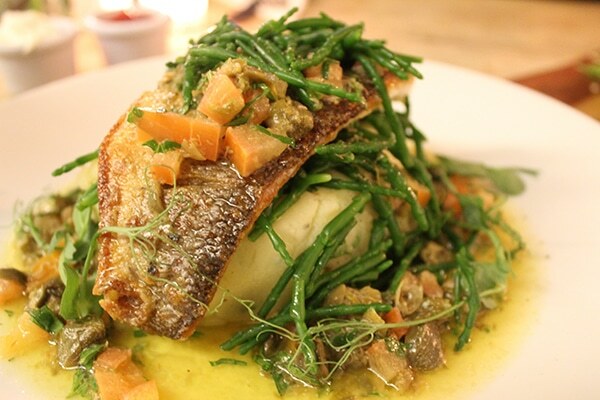 Lucy’s sea bass has beautiful, golden, crispy skin and is resting on top of a lovely velvety mash. The fish is perfectly cooked and seasoned, the texture of the mash makes the dish melt in your mouth; it is delicious. You get the saltiness and added taste of the sea from the samphire and also the caper sauce which brings the plate to life with colour and taste. In a city filled with great seafood restaurants, The Black Lion has served a dish that can sit proudly on any of their menu. Feeling extremely full, but not ones to give up, we decided to share a dessert. The chocolate and peanut brownie caught both of our eyes when ordering the main and we have to try it. 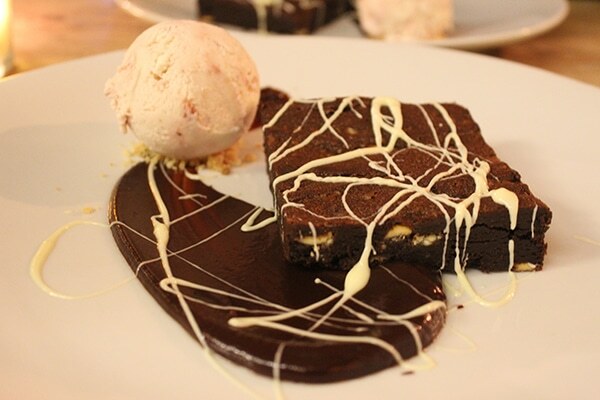 The brownie is served with a homemade jam ice cream and drizzled with white chocolate. It is a nice sized slab and looks amazing. We quickly dig in and the peanut flavour with the chocolate is a winning combination. Moist but not runny, the brownie is good but the star of the show for me is the homemade jam ice cream. 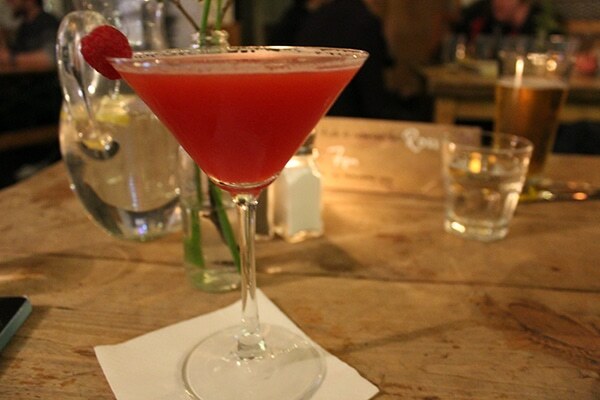 The strawberry is subtle but just the right balance, if you have a sweet tooth one afternoon and want treat pop in to The Black Lion you will not be disappointed! 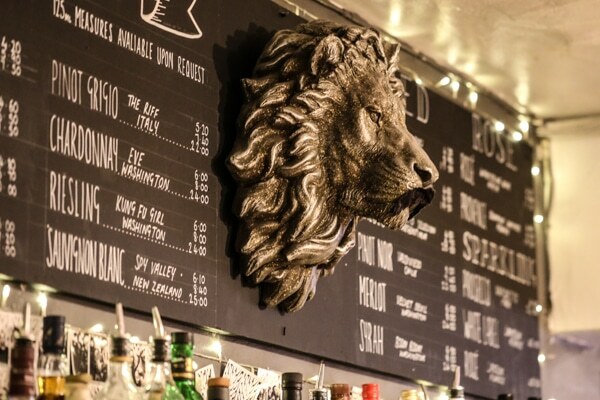 Amazing drinks, fantastic staff, brilliant location, if you haven’t been already then The Black Lion needs to go to the top of your list! It’s a proper pub.